Guanaja holds similar saltwater fly-fishing to Mexico and Belize. What makes Guanaja unique is that you are usually the only one fishing there. 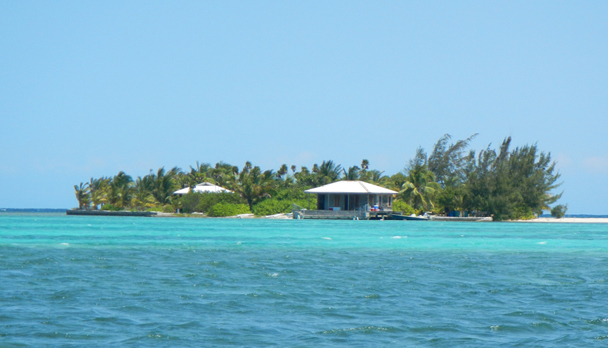 Guanaja is a diverse Caribbean fishery surrounded by sand, turtle grass, and coral flats. Although the main hunt is for bonefish, permit, and tarpon, there's fishing for other species in different venues. You wade fish about 65 percent of the time and fish out of the boat the other 35 percent. Guanaja holds similar saltwater fly-fishing to Mexico and Belize. What makes Guanaja unique is that you are usually the only one fishing there. Guanaja is a diverse Caribbean fishery surrounded by sand, turtle grass, and coral flats. 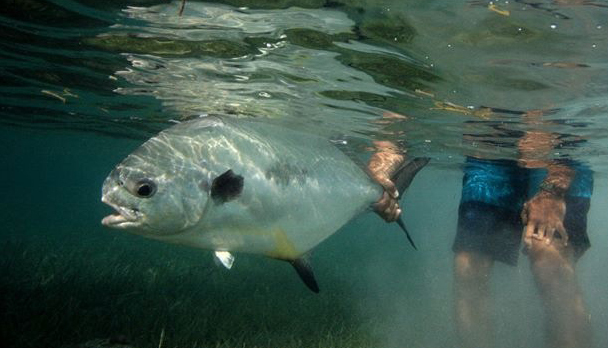 Although the main hunt is for bonefish, permit, and tarpon there's fishing for other species in different venues. You wade fish about 65 percent of the time and fish out of the boat the other 35 percent. The bone-fishing in Guanaja is phenomenal, hunting big singles reaching 10 pounds right in front of the lodge. Guanaja has several flats surrounding the island and you see schools of 10-200 fish all day long. The average landing size is 5 to 8 lbs. Guanaja is one of the few permit fisheries in the world. We see on average 10-50 permit a day and get several shots. Permit range from juveniles to full blown giants over 30 pounds. There's permit tailing on the flats all over the South Keys (the lodge is one of these keys), and also fish them in river mouths and deeper water. There's also baby tarpon and snook fishing. The baby tarpon range from 5-40 pounds and sight-cast to them on the moving tide. There are also big resident tarpon reaching over 100 pounds. You often get into large schools of snook and land over 20 in a session. The daily fishing programme will normally begin at 6:30 am to provide the best spread of tide conditions throughout the day. A light breakfast is available from 6 am. Fishermen can then return for a "proper" breakfast around 9.30 am. For non-anglers a normal breakfast service is provided from 8 am onwards. Depending on location, lunch can either be taken back at the Lodge (followed by a siesta if desired) or in the form of a packed lunch in the skiff, or on a beach. All fishermen are encouraged to be back at the Lodge by 6pm, with dinner being served around 7.00pm. The lodge is a private key in the middle of the best flats in Honduras, with private beach. It takes up to 6 anglers per week. The main lodge is a plush house with 2 bedrooms and two full bathrooms, with hot water and air condition. There's also a guest cabin with two more beds and a bathroom. The deck on the lodge is expansive, lined with hammocks, and over looks the flats full of bonefish and permit. You can literally cast from the deck to tailing fish, or heckle friends as they pursue fish throughout the flat. There are shaded hammock spots around the island where you can chill out during a slack tide, waiting for tails to show up. The chefs have been trained by several culinary masters flown in from the United States and have elevated the cooking scene to a profound level. Using local delights like lobster, shrimp, fresh fish, vegetables, and fruit, combined with extensive training, the chefs put together an exquisite menu. Local rum, beer, tequila, wine, and sodas are provided. Saltwater reel with a tough disk drag system accommodating at least 250-yard backing. Flies tied on hooks 4 or 2. Crab patterns in natural, brown and green. Del�s Merkin, Del Browns Hermit, Kung Fu Crab, Brown Special, Rag Head, Mc Crab, Turneffe Crab, etc. Saltwater reel with a tough disk drag system accommodating at least 150-yard backing. 10 to 12-foot leaders, 10-pounds minimum (we recommend fluorocarbon). Flies tied on hooks 8 or 6. Crazy Charlie, Gotcha, Clousers, Shrimp patterns and little crabs (olive and natural). Flies tied on hooks 1/0,2/0 and 3/0. Black Death, Purple Death, Cockroach, Stu Apte, Gummy Minnow, etc. Rates include: 7-night accommodation and 6 full fishing days. All meals and beverages, open bar, use of rods, reels and fly-tying table. 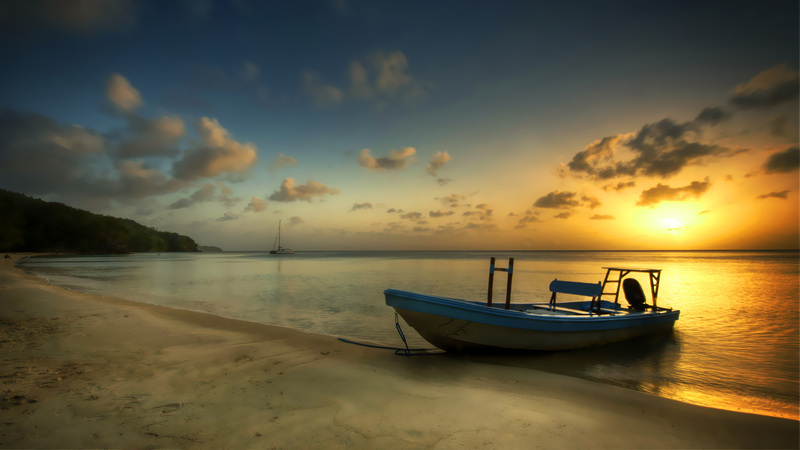 Rates do not include: International flights, boarding taxes, round-trip to Guanaja from Roatan (U$S 200 approx), personal insurance, gratuities for lodging staff and guides. Very good fishing and weather. 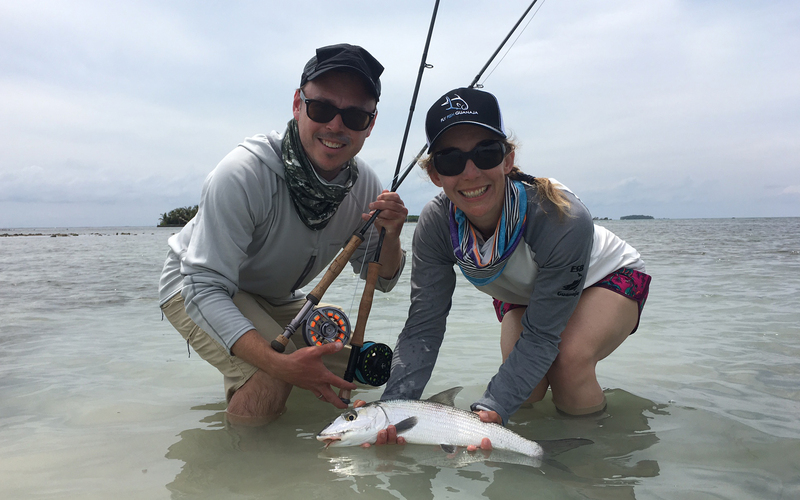 First time lady anglers caught lots of bonefish and their couples landed 3 permit� quoted "One of best the trips of their lives, as much about the people and place as about the fish."